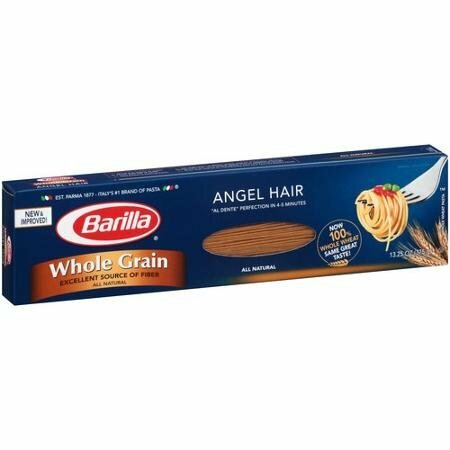 Barilla Whole Grain Angel Hair Pasta 13.25 Oz (Pack of 4) by Barilla at Rae Of Sunshine Life. Hurry! Limited time offer. Offer valid only while supplies last. Barilla Whole Grain is the delicious way to enjoy whole grain pasta, with the taste and quality you have come to expect from Italy's #1 pasta brand. Barilla Whole Grain is the delicious way to enjoy whole grain pasta, with the taste and quality you have come to expect from Italy's #1 pasta brand. Barilla Whole Grain is all natural and an excellent source of fiber. View More In Pasta & Noodles. If you have any questions about this product by Barilla, contact us by completing and submitting the form below. If you are looking for a specif part number, please include it with your message. Maurizio - Italian Casarecce Pasta, (4)- 17.6 oz. Pkgs.